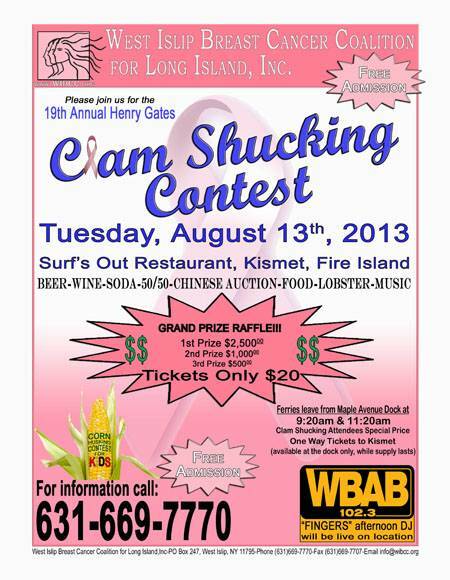 The Clam Shucking fundraising event for West Islip Breast Cancer Coalition (WIBCC ) has always gone off under almost magical weather conditions – hot and sunny. 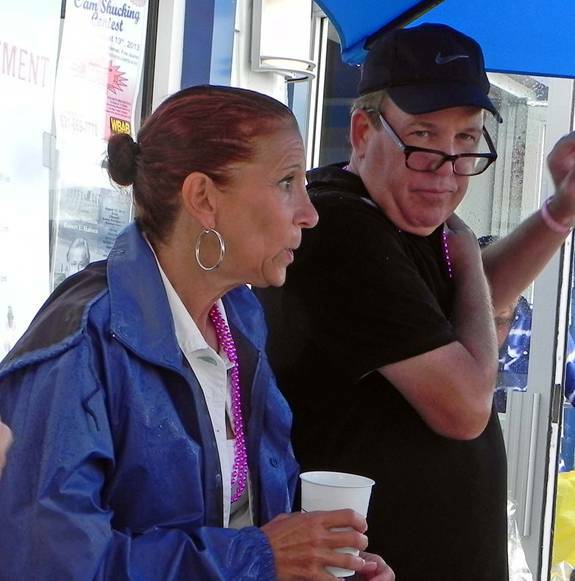 Once in the early days, a morning rain stopped at 11 a.m. and last year the rain didn’t start until after 3 p.m. 2013 was the bad luck year when the weather gods and goddesses decided to try our resolve. But the event went on and the people came in soggy droves on the free FI ferries, by boat and bicycle. 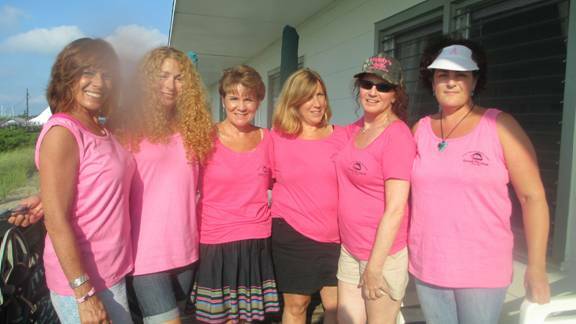 The event was under the auspices of Margaret Campise of WIBCC, Jane Mooney of FI Ferries and Deb Sommeso of Surf’s Out. 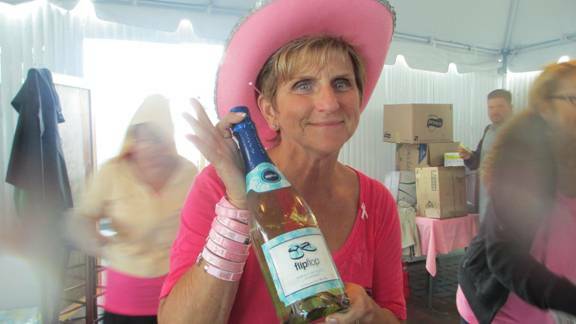 There were hundreds of donors of food, drink and prizes – too many to mention them all. 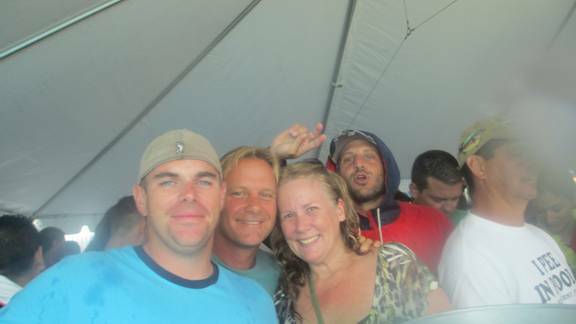 Some local sponsors included Atlantic Auto, WBAB, FI Ferries, Surf’s Out, Fire Island Beer, Pete from Viking (shirts) and Rainbow Party Rentals (tents). 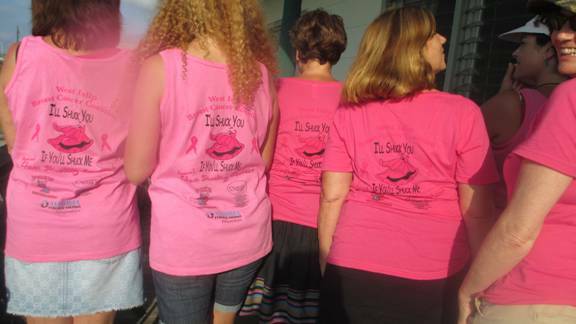 Volunteers came from WIBCC, Kismet and old friends of Kismet. 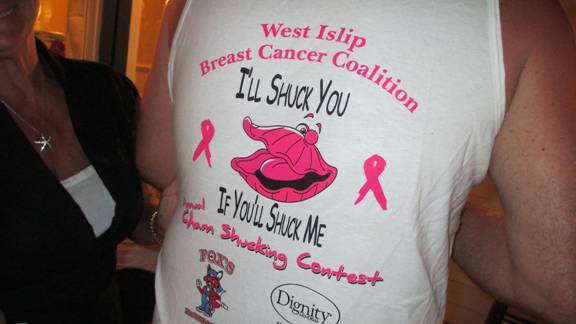 There was a large group with breast cancer themed patches on sweatshirts from the West Islip Fire Dept Second base, a group that loved Good Sam umbrellas and many folks with Mother Shuckers t-shirts. 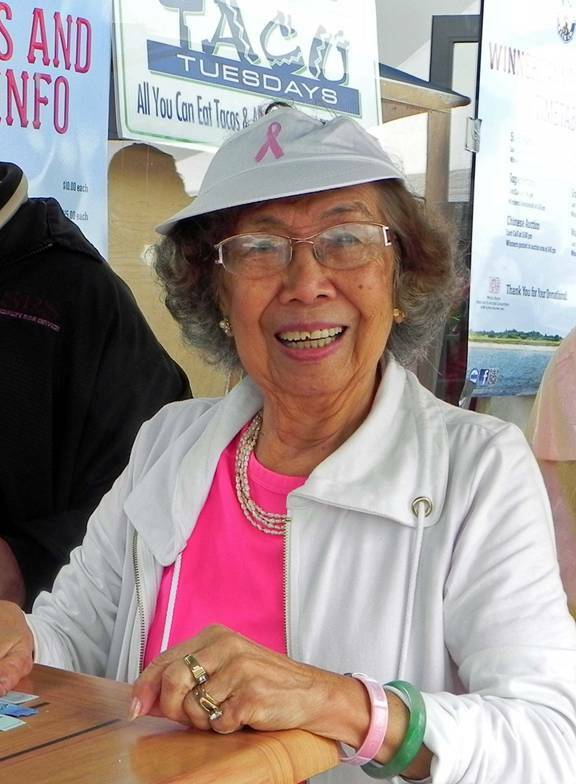 Initial doubts and skepticism about the day gave way to smiles, dancing and cheering as clothes dried out and raingear was shed under the big tent. 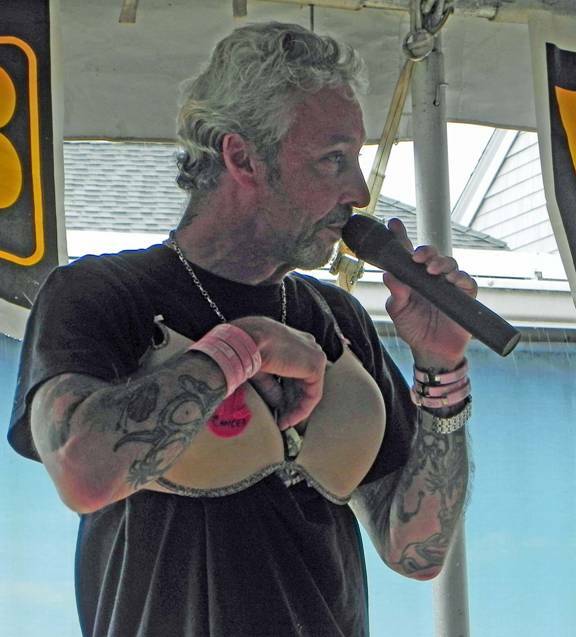 DJ “Fingers” from WBAB did a masterful job as MC, cheering the crowd with his humor – and his outlandish woman’s bra stuffed with $400 in donations – while reminding the crowd of the seriousness of the event. 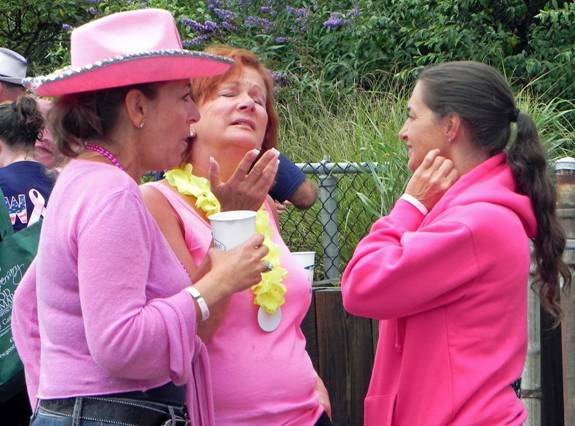 Many people were there because breast cancer had affected their families. 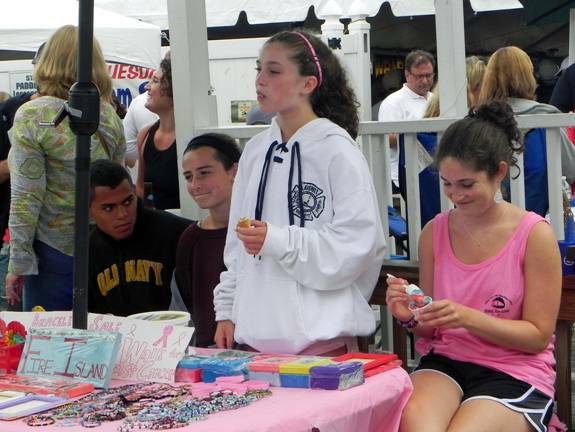 The young cousins Sarah, Lianna and Lindsey and the sisters Danielle and Marissa have come for years to raise money for both the Avon Walk and WIBCC. 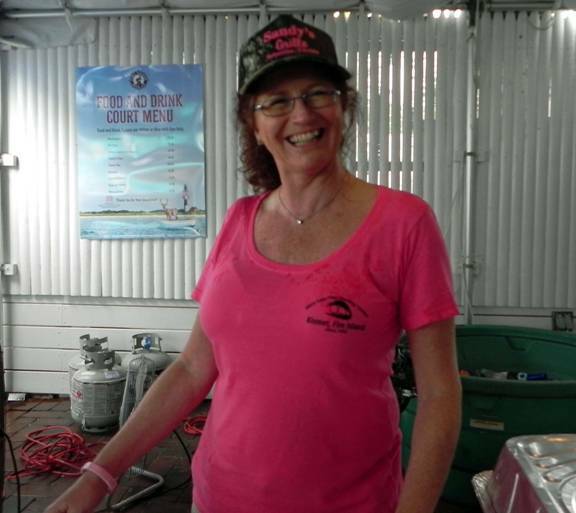 Darlene Stanfield, obviously not a professional clam shucker, entered the contest in memory of the recent loss of her mother. 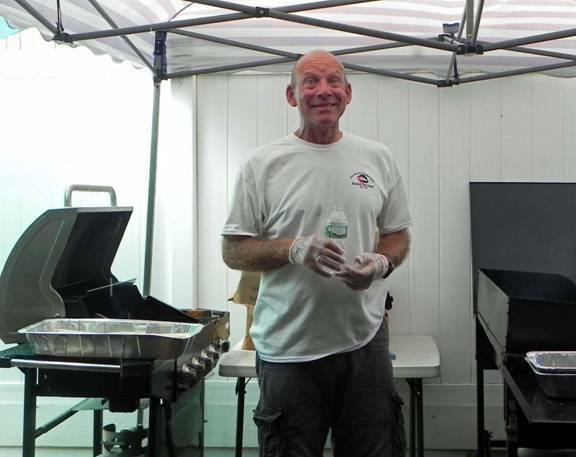 In a touching, spontaneous moment, shuckers Pat Boyle and Carlos Tigre stepped in near the end to help finish her clams. 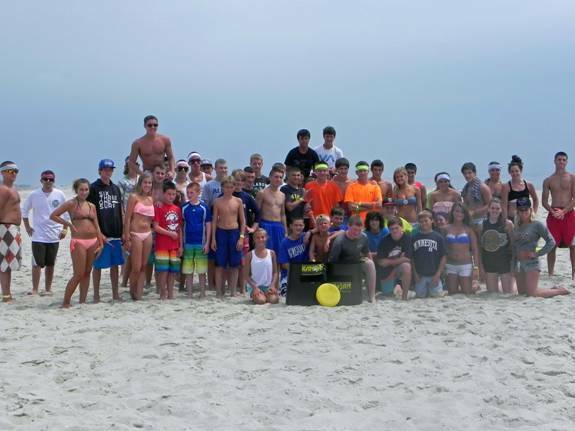 The fundraiser actually began Monday with the 3rd annual Kan Jam Beach Tournament. 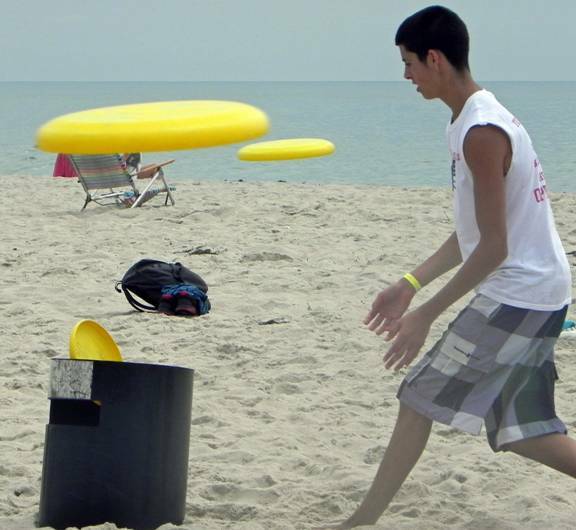 Sixteen-year old Brett Whooley of All 4 You, organized the Kan Jam contest on the beach as part of big events for the West Islip Breast Cancer Coalition. 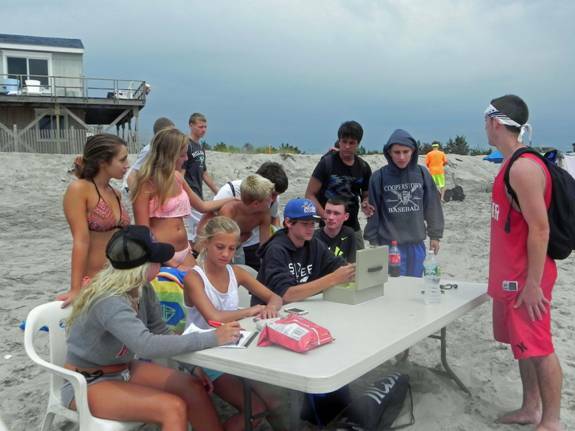 Over thirty teams of two Kan Jammers each responded to Brett’s outreach. As they arrived, many in “uniforms”, Brett’s mother and siblings TJ and Megan helped register the players, collecting a $5 entry fee. 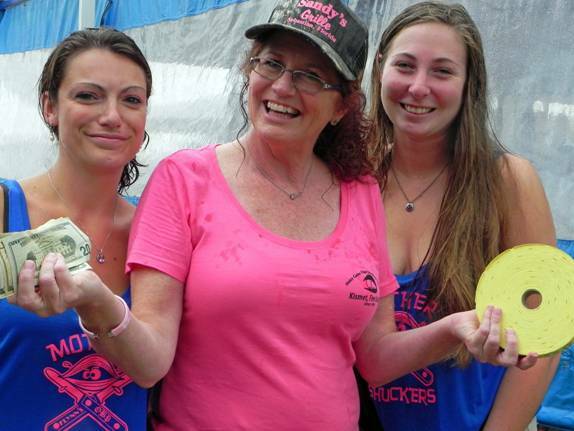 The Whooley’s were unable to offer their beach house for a fundraising raffle because of damage from the Sandy storm, but they plan to revive that offering in 2014. 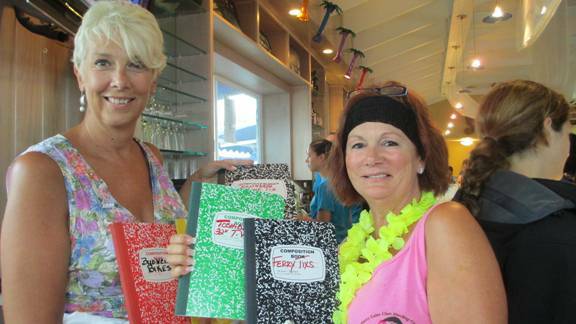 Tuesdays other events included the familiar Chinese Auction, an upscale auction, the 50-50 drawing (won by Don from Lindenhurst), the Grand Prizes drawing (Tony Roman $2500, Rosemare $1,000 and Gail Asebeo $500), the numbers board with prizes including airline tickets. 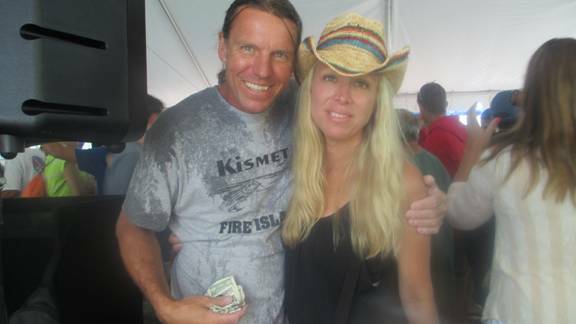 Jeannine Wiley won the Budweiser bike. 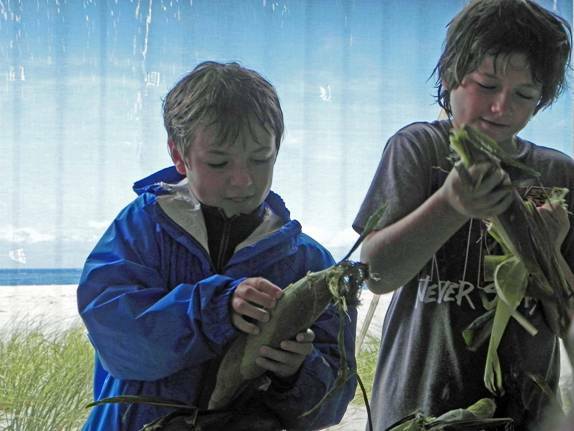 The corn shucking event, presided over by “Fingers” and our Buddy, again attracted a lot of kids who all won prizes. 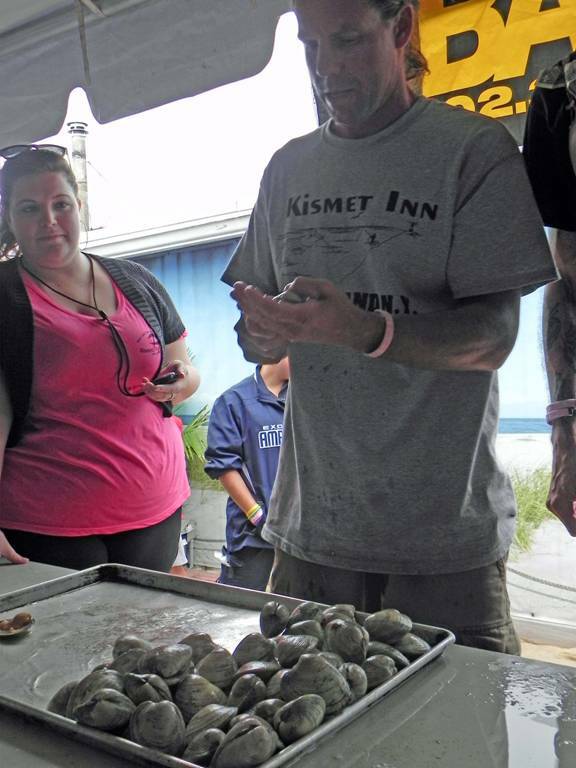 There were 18 entrants in the Clam Shucking event with five sponsored by the Kismet Inn (including Brittany Mooney [also a Timer] and former winner, Gary Leschinski) The Inn also supplied the clams. 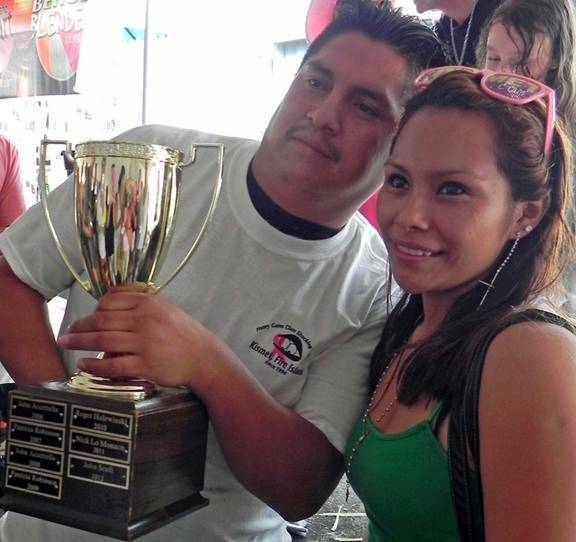 Brittany Metcalf, another timer, helped Fingers keep the crowd revved up by tossing out bracelets and little prizes of all kinds, predominantly in pink Newcomer Carlos Tigre from Nicky’s Clams, with a time of 4:36, handily beat out all competition, with the two runners up, John Senft at 5:11 and Anthony Gipetto at 5:12. An early count estimated a take of just under $50,000 – not bad for a rainy day. 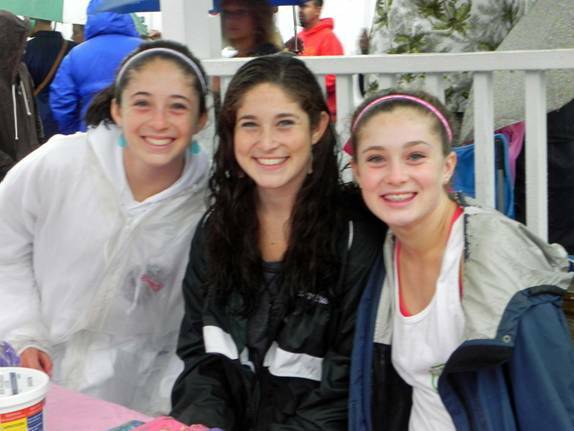 Do you think this rain will last? 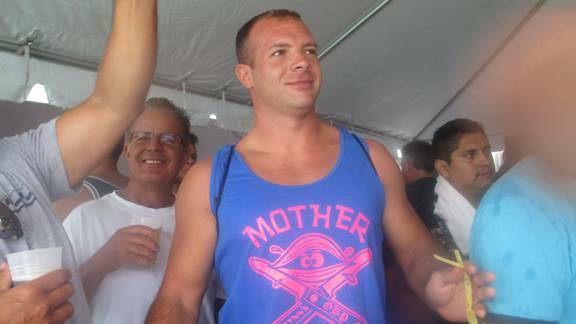 Poster boy – “shucker” on bottom (I hope)? 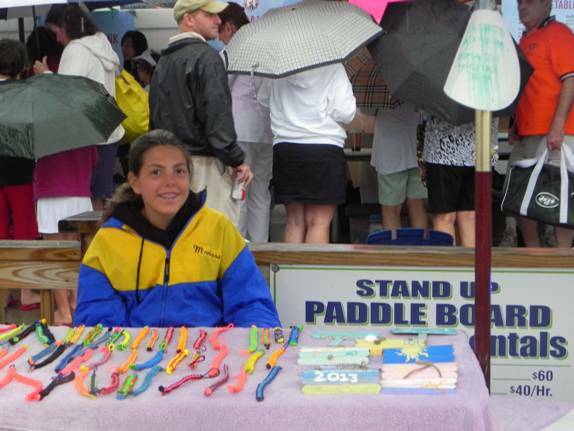 Despite the rain we did raise a little over $50K, As you can see by being there, the rain did not "dampen" any of the fun, or discourage the crowds from show up!! 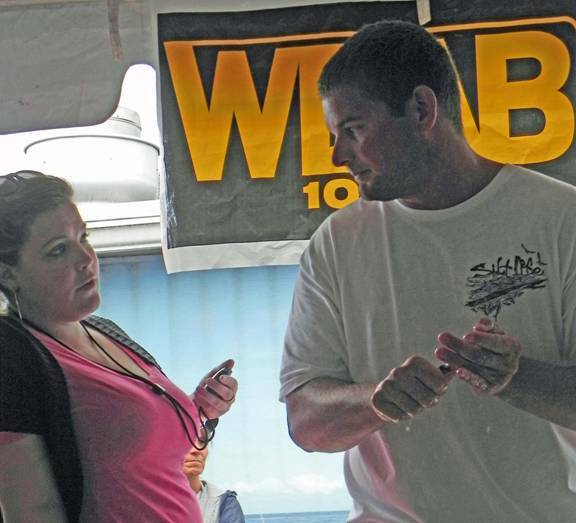 Fingers from WBAB, was wonderful, kept the crowd going, was great with the corn husking and clam shucking events. 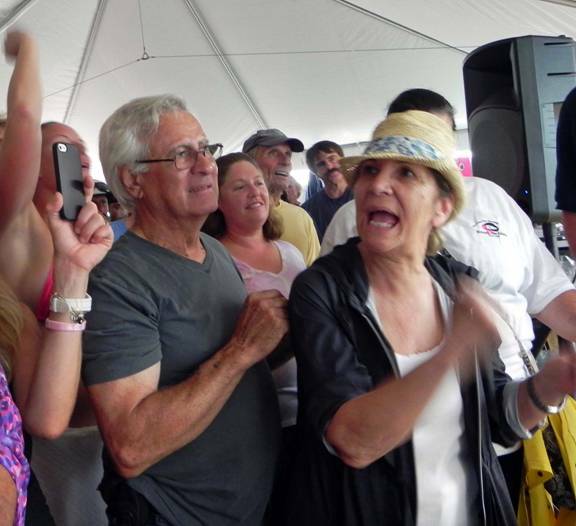 The crowd really liked him and he added to the fun.